Exclusive! Tell your friends how you really feel! 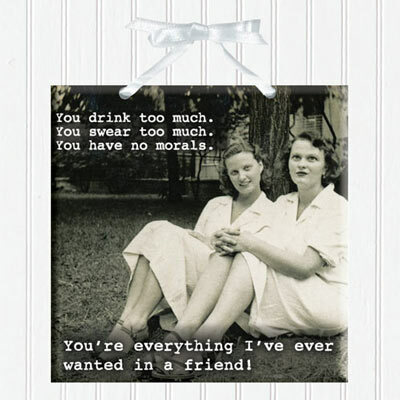 Our Drink Too Much Plaque with a witty saying and vintage image are sure to spread cheer and friendship all around. Ceramic with ribbon hanger. Imported. 6" sq. I find these plaques make wonderful hostess gifts , a great addition to birthday gifts or just because gifts.My friends and family love receiving them because it makes them laugh and lets them know I'm thinking of them.